For the glass in which beer is served, see Pint glass. The pint (/ˈpaɪnt/, listen (help·info); symbol pt, sometimes abbreviated as "p") is a unit of volume or capacity in both the imperial and United States customary measurement systems. In both of those systems it is traditionally one-eighth of a gallon. The British imperial pint is about 20% larger than the American pint because the two systems are defined differently. Almost all other countries have standardized on the metric system, so the size of what may be called a pint varies depending on local custom. The imperial pint (≈ 568 ml) is used in the United Kingdom and Ireland and to a limited extent in Commonwealth nations. In the United States, two pints are used: a liquid pint (≈ 473 ml) and a less-common dry pint (≈ 551 ml). Each of these pints is one-eighth of its respective gallon, but the gallons differ. This difference dates back to 1824, when the British Weights and Measures Act standardised various liquid measures throughout the British Empire, while the United States continued to use the earlier English measure. The imperial pint consists of 20 imperial fluid ounces and the US liquid pint is 16 US fluid ounces, making the imperial fluid ounce about 4% smaller than the US fluid ounce. All of the other former British colonies, such as Canada, Australia, South Africa and New Zealand, converted to the metric system in the 1960s and 1970s; so, while the term "pint" may still be in common use in these countries, it may no longer refer to the British imperial pint once used throughout the British Empire. In the United Kingdom, the imperial pint is still the primary unit for draught beer and cider, as it is for milk sold in returnable bottles and some cartons. In the UK, legislation mandates that draught beer and cider may be sold by the imperial pint in perpetuity, and in public houses can only be sold in a third of a pint, two-thirds of a pint or multiples of half a pint, which must be served in stamped measured glasses or from government-stamped meters. Since the majority of countries in the world no longer use American or British imperial units, and most are non-English speaking, a "pint of beer" served in a tavern outside the United Kingdom and the United States may be measured by other standards. In Commonwealth countries it may be a British imperial pint of 568 ml, in countries serving large numbers of American tourists it might be a US liquid pint of 473 ml, in many metric counties it is a half-litre of 500 ml, or in some places it is another measure reflecting national and local laws and customs. Historically, units called a pint (or the equivalent in the local language) were used across much of Europe, with values varying between countries from less than half a litre to over one litre. Within continental Europe, these pints were replaced with liquid measures based on the metric system during the 19th century. The term is still in limited use in parts of France, where "une pinte" means an imperial quart, which is 2 imperial pints, whereas a pint is "une chopine"—and Central Europe, notably some areas of Germany and Switzerland, where "ein Schoppen" is colloquially used for roughly half a litre. In Spanish holiday resorts frequented by British tourists, 'pint' is often taken to mean a beer glass (especially a dimple mug). Half-pint and pint mugs may therefore be referred to as pinta pequeña ('small pint') and pinta grande ('large pint'). Pint comes from the Old French word pinte and perhaps ultimately from Vulgar Latin pincta meaning "painted", for marks painted on the side of a container to show capacity. The imperial pint is equal to one-eighth of an imperial gallon. In the United States, the liquid pint is legally defined as one-eighth of a liquid gallon of precisely 231 cubic inches. In the United States, the dry pint is one-eighth of a dry gallon. Blueberries labelled in English (1 US DRY PINT) and French (1 CHOPINE SÈCHE US 551 ml) for sale in the US and Canada. The United States dry pint is equal to one-eighth of a United States dry gallon. It is used in the United States, but is not as common as the liquid pint. A now-obsolete unit of measurement in Scotland known as the Scottish pint or joug equals three imperial pints. It remained in use until the 19th century, surviving significantly longer than most of the old Scottish measurements. This is one of numerous false friends which exist between English and French. They are not the same unit although they have the same linguistic origin. The French word pinte is etymologically related, but historically described a larger unit. The Royal pint (pinte du roi) was 48 French cubic inches (952.1 ml). but regional pints varied in size depending on locality and on commodity (usually wine or olive oil) varying from 0.95 L to over 2 L.
In Canada, the Weights and Measures Act (R.S. 1985), which has the laws in English and French printed side-by-side, defines a pint in English as 1/8 of a gallon, but defines a pinte in French as 1/4 of a gallon. Thus, if you speak English and order "a pint of beer", servers are legally required to serve you 568 ml of beer, but if you speak French and order "une pinte de bière", they are legally required to serve an Imperial quart (une pinte), which is 1136 ml—twice as much. To order an Imperial pint when speaking French in Canada, one must instead order une chopine de bière. In Flanders, the word pintje, meaning 'little pint', refers only to a 250 ml glass of lager. Some West- and East-Flemish dialects use it as a word for beaker. The equivalent word in German, Pintchen, refers to a glass of a third of a litre in Cologne and the Rhineland. In South Australia, ordering "a pint of beer" results in 425 ml (15 fl oz) being served. Customers must specifically request "an Imperial pint of beer" to get 570 ml (20 fl oz). Australians from other states often contest the size of their beers in Adelaide. One US fluid pint of water weighs about a pound (16 ounces), resulting in the popular saying, "A pint's a pound, the world around." However, a US pint of water weighs 1.04375 pounds and the statement does not hold the world around because the imperial (UK) pint, which was also the standard measure in Australia, India, Malaya, New Zealand, South Africa, etc., weighs 1.25 pounds. A different saying for the imperial pint is "a pint of water's a pound and a quarter". The pint is traditionally one-eighth of a gallon. In the Latin of the apothecaries' system, octavius or octarius (plural octavii or octarii; symbol O) reflected the "eighth" concept in its octa- syllable. Because of the variety of definitions of a gallon, there have been equally many versions of the pint. America adopted the British wine gallon, defined in 1707 as 231 cubic inches exactly (3 in × 7 in × 11 in) as its basic liquid measure, from which the US wet pint is derived; and the British corn gallon (​1⁄8 of a standard "Winchester" bushel of corn, or 268.8 cubic inches) as its dry measure, from which the US dry pint is derived. In 1824, the British parliament replaced all the various gallons with a new imperial gallon based on ten pounds of distilled water at 62 °F (16.667 °C) (277.42 cubic inches), from which the current UK pint is derived. The various Canadian provinces continued to use the Queen Anne Winchester wine gallon as a basis for their pint until 1873, well after Britain adopted the imperial system in 1824. This made the Canadian pint compatible with the American pint, but after 1824 it was incompatible with the British pint. The traditional French "pinte" used in Lower Canada (Quebec) was twice the size of the traditional English "pint" used in Upper Canada (Ontario), about 1 litre versus 0.5 litres. After four of the British provinces united in the Canadian Confederation in 1867, Canada legally adopted the British imperial system of measure in 1873, making Canadian liquid units incompatible with American ones from that year forward. In 1873, the French Canadian "pinte" was defined as being one imperial quart or two imperial pints, while the imperial pint was legally called a "chopine" in French Canada. Canadian imperial units of liquid measure remain incompatible with American traditional units to this day, and although the Canadian pint, quart, and gallon are still legal units of measure in Canada, they are still 20% larger than the American ones. In the British and Irish metrication processes, the pint was replaced by metric units as the legally defined primary unit of measure for trading by volume or capacity, except for the sale of draught beer and cider, and milk in returnable containers. The pint can still be used in those countries as a supplementary unit in all circumstances. Legislation in the UK mandates the use of the pint as a measure for draught beer and cider (in pubs for instance). For milk, if returnable containers are used, the pint can still be the principal unit used, otherwise metric units (usually the non-SI litre) must be used. There is no requirement for the litre quantity to be round numbers: thus the quantity of milk sold in a non-returnable container may be 1 pint, but will have "568 ml 1 pint", or just "568 ml" on the label. Many recipes published in the UK and Ireland still give ingredient quantities in imperial, where the pint is often used as a unit for larger liquid quantities. The Guild of Food Writers recommends that new recipes be published in metric units. The British Virgin Islands also requires that beer and cider be sold in pints. Also, in Canada, water amounts in air purifiers are advertised in pints as well as BTUs ("British thermal units"), see metrication. In Australia and New Zealand, a subtle change was made to 1 pint milk bottles during the conversion from imperial to metric in the 1970s. The height and diameter of the milk bottle remained unchanged, so that existing equipment for handling and storing the bottles was unaffected, but the shape was adjusted to increase the capacity from 568 ml to 600 ml – a conveniently rounded metric measure. Such milk bottles are no longer officially referred to as pints. However, the "pint glass" in pubs in Australia remains closer to the standard imperial pint, at 570 ml. It holds about 500 ml of beer and about 70 ml of froth, except in South Australia, where a pint is served in a 425 ml glass and a 570 ml glass is called an "imperial pint". In New Zealand, there is no longer any legal requirement for beer to be served in standard measures: in pubs, the largest size of glass, which is referred to as a pint, varies, but usually contains 425 ml. In Canada, the "pint of beer" served in pubs and bars has long been considered a colloquial term for "a large glass of beer". Legally speaking, after 1873, it was defined as one British imperial pint of 20 imperial ounces. On the other hand, the United States continued to use a smaller 16 imperial ounce pint, while in French Canada after 1873 a "pinte de bière" was defined as a much larger 40 ounce quart of beer, so confusion arose to which was being used. Prior to 1961, bottled beer in Canada was served in two sizes, colloquially known as "quarts" and "pints". They were 22 and 12 imperial ounces (625 and 341 ml), respectively, which were much smaller than the British units. Some provinces banned the sale of beer in the larger bottle. For example, in Ontario in the 1950s only the smaller size could be sold, but in Quebec both sizes were about equally common. The numerous incompatibilities between traditional Canadian, British, French, and American unit systems was one of the driving forces behind metrication in Canada. Draft beer in Canada, when advertised as a "pint", is legally required to be 568 ml (20 fluid ounces). With the allowed margin of error of 0.5 fluid ounces, a "pint" that is less than 554 ml of beer is an offence, though—to the detriment of consumers—this regulation is often violated and rarely enforced. After metrication in Canada, companies sold milk and other liquids in metric units so conversion issues could no longer arise. 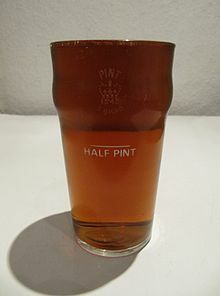 Legally speaking, although some British imperial units are still legally usable in Canada, as a result of Canada's colonial history, the "pint" served in drinking establishments in Canada should be the larger 20 ounce British imperial pint, rather than the smaller 16 ounce American traditional pint. Under the Canada Weights and Measures Act, if asked for a "pint of beer", businesses should serve customers 0.568 litres of beer with an accuracy of 0.5%, and if asked for a "pinte de bière" they should serve them 1.136 litres. The Imperial system of measurement is no longer taught in Canadian schools, which leads to confusion when customers ask how big a drinking establishment's pints are. Servers and even managers may not know. To avoid legal issues, many drinking establishments are moving away from using the term "pint" and are selling "glasses" or "sleeves" of beer, neither of which have a legal definition. A 375 ml bottle of liquor in the US and the Canadian maritime provinces is sometimes referred to as a "pint" and a 200 ml bottle is called a "half-pint", harking back to the days when liquor came in US pints, fifths, quarts, and half-gallons. Liquor in the US has been sold in metric-sized bottles since 1980 although beer is still sold in US traditional units. In France, a standard 250 ml measure of beer is known as un demi ("a half"), originally meaning a half pint. ^ a b Fifty imperial pints or sixty US liquid pints are both very close to one cubic foot. ^ IEEE SA - 260.1-2004 - IEEE Standard Letter Symbols for Units of Measurement (SI Units, Customary Inch-Pound Units, and Certain Other Units). IEEE. 2010. Retrieved 10 June 2017. ^ BS 350:Part 1:1974 Conversion factors and tables - Part 1. Basis of tables Conversion factors. British Standards Institution. 1974. pp. 10–11. ^ "Definition of P". www.merriam-webster.com. Retrieved 29 May 2017. ^ "Weights and Measures". British Beer and Pub Association. Retrieved 10 January 2015. ^ American Journal of Physics, v.67(1), 1999-Jan, p.13-16, Romer,R.H. ; Editorial: Units: SI only, or multi-cultural diversity? ^ Duden, February 28th, 2016. ^ "Pint". Merriam-Webster.com. 2013. Retrieved 31 May 2013. ^ Text of the Units of Measurement Regulations 1995 (Schedule) as originally enacted or made within the United Kingdom, from legislation.gov.uk. ^ a b Palaiseau, JFG (October 1816). Métrologie universelle, ancienne et moderne: ou rapport des poids et mesures des empires, royaumes, duchés et principautés des quatre parties du monde. Bordeaux. p. 8. Retrieved 30 October 2011. ^ "Weights and Measures Act (R.S. 1985)" (PDF). ^ "Pints of draft beer". Measurement Canada. Retrieved 2016-09-18. ^ The site Measurement Canada contains a wealth of documentation on official Canadian measurements. The French language version of the site is Mesures Canada. ^ "Chopines de bière pression". Mesures Canada. Retrieved 2016-09-18. ^ Keane, Daniel (September 8, 2017). "Getting to the bottom of the pint: the bitter problem of Adelaide's beer glasses". ABC News. Adelaide. Retrieved September 9, 2017. ^ "A Pint's a Pound the World Around". Government Book Talk (blog). U.S. Government Publishing Office. 2010-04-27. Retrieved 2017-01-30. ^ "Campaigns – Metrication". Guild of Food Writers. Retrieved 2 December 2011. ^ "Fairness at the Pumps Act". Industry Canada. Archived from the original on 24 September 2014. Retrieved 22 September 2014. ^ "We Demand a Full Pint". Toronto Star. Retrieved 22 September 2014. ^ Elizabeth E. Epstein, Barbara S. McCrady. Overcoming Alcohol Use Problems: A Cognitive-Behavioral Treatment Program. Oxford University Press. p. 7. Look up pint in Wiktionary, the free dictionary. Wikimedia Commons has media related to Pint. This page was last edited on 28 March 2019, at 23:30 (UTC).